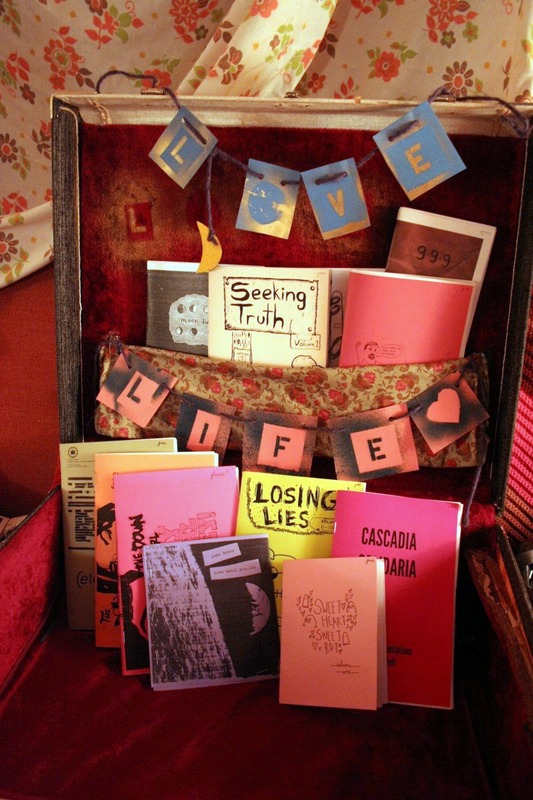 Cascadian compa Jane Applesauce will be travelling North America this summer, playing music as Cowlick and carrying along a suitcase full of fine zines, comics and CDs as part of the brand-new Lovelife Distro. The tour is already on the road and the itinerary will stretch from Bellingham to Bloomington. Jane has graciously re-printed and asked to distribute Cascadia Solidaria’s first poetry zine alongside other excellent items including Paul Brown’s “Eleven Months,” a powerful reflection on working in a Seattle jail; comics by Losing Lies; and the touching comic memoir “Who Loves You More than Anything?” by Jennifer Williams. Send an e-mail to Lovelife distro at cowlick[at]riseup[etc]net for more information. – Thanks Jane and Lovelife! This entry was posted in Life and tagged cds, comics, distro, DIY, literature, lovelife, memoir, poetry, prison, translation, zine, zines. Bookmark the permalink.